With a group of cool and exciting features this year Google is focused on making our digital lives calm and organized through Android P. Concentrating on missing features from the initial release version, company worked with different approach on the first Android P preview and its major features. The changes that an average user can take advantage of. However comparing with the second beta, we have a better idea of what to everyday users can expect from Android P. Google with such unique step is trying to make smart phones adapt to user habits with the help of machine learning and Artificial Intelligence. After renovating the User Interface, the Android P now offers you great features to curb your phone usage. Without further delay, let’s go through some of the best Android P features. Gesture Navigation: Only an option is given to use a new single home button instead of three buttons set on the home screen. This change allows users to swipe up to view recent apps along with a UI that suggests apps you might use. Swiping the button left and right lets you quickly switch between apps. These changes make navigation more easy and friendly. Dashboard: Google broadcasted a group of features that help you to control how you use your phone. It’s easy to lose track of time while you are glued to your phone watching YouTube videos, playing games, or checking out social media. As it is all about time ‘Dashboard’ allows to breaks downs phone usage data to show how you spend time on your device. It includes a pie chart signifying the time spent in each app per day and also in hour by hour basis. The details such as number of times you unlocked your phone or total number of notifications you have received can be viewed. This new feature enables indoor GPS style tracking by determining your location within a building and facilitating turn-by-turn directions to help you navigate indoors. It’s one of the best features that Android fans are waiting for. It means you can now find your way across short distances within malls and large buildings. Android P now supports IEEE 802.11mc WiFi protocol which is also known as Wi-Fi Round-Trip-Time (RTT). Do Not Disturb: Android P act smart through its modified Do Not Disturb mode when anyone is busy in meetings and family gathering where everyone demands your full presence. By activating this feature, it not only silences the phone calls and notifications but also all the visual interruptions like notifications that frequently pop up on your screen. Just put your phone face-down on the table and it automatically enters the DND mode, to activate Shush mode. Another gesture-based Android P feature called ‘Shush’ makes it easier to distance yourself away from calls and notifications by enabling Do Not Disturb mode. Wind Down: These days many of us spend hours on our phones at night before we actually fall asleep. Here comes this features Wind Down with will help you curb this habit by switching on Night Light and turning on the Do Not Disturb mode at your chosen bedtime. You just need to select the time at which you would like to go to bed, and Android P will fade the screen to grayscale to help you remember to sleep at the selected time. Messaging apps: Focusing on the messaging apps several improvements are made to enhance the overall experience. It includes Smart Reply that is reply quickly to messages through the notification shade and also use suggested responses that are created by analysis of the incoming messages. This feature is a provision for developers to make images viewable in the notification shade for all incoming messages. Screenshots: Android P’s new screenshot editor provides an easy and flexible platform where you can edit and share your screenshots immediately after taking them. Without struggling with the power + volume down buttons another handy screenshot button is added to the power menu. Security: It is seen that once allowing an app to access to your camera and mic, it uses them whenever required. But Android P will block apps running in the background from accessing camera and microphones. And in any case any attempt is done, it will be shut down and receive system errors. With privacy concerns like social sites tracking your activities, it’s a relief to know that Android has revamped its privacy factor in the newest version. 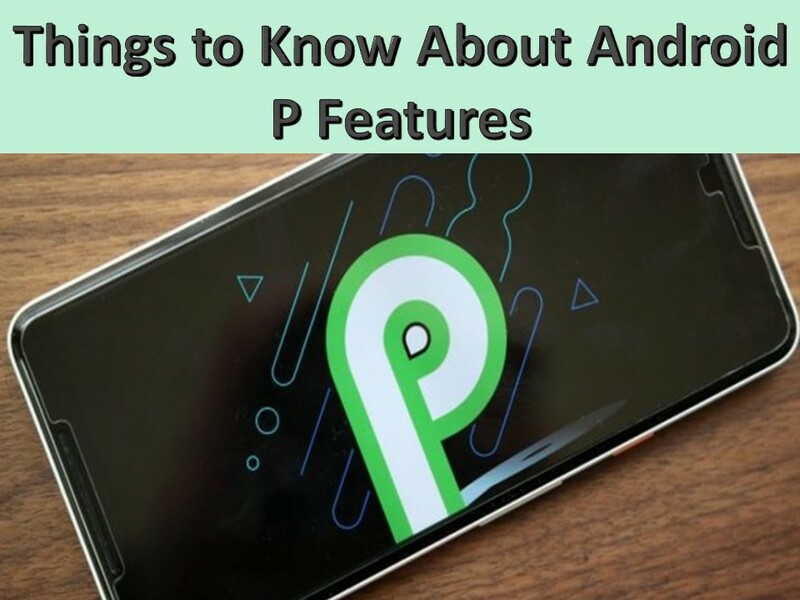 We hope the above information about Android P proves useful to you. Please feel free to share your feedback or queries in the comments section below. Author Bio: Colleen Jansen is a digital marketing expert in Quy Technologies, a leading Augmented Reality App Development company which provides Ar App for Education, Real estate, healthcare, Ecommerce industry across the global. She loves to write on latest mobile trends, mobile technologies, startups and enterprises.